TwitterUS President Barack Obama and his daughters Sasha and Malia (L) shop at Politics and Prose bookstore in Washington November 29, 2014. 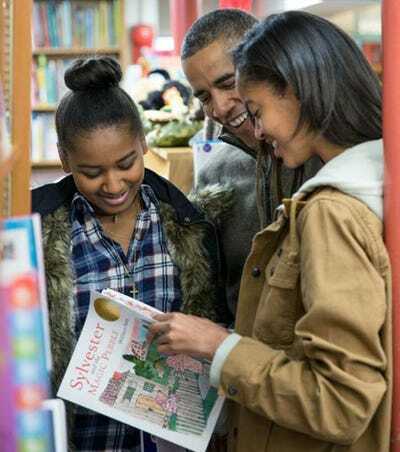 President Barack Obama and his teenaged daughters, Sasha and Malia, went to an independent book store in Washington to buy books as a way to promote Small Business Saturday, an event aimed at boosting small businesses. “Do I get a discount for that?” the president asked jokingly while unloading a bunch of books from his shopping basket at the Politics and Prose book store on Saturday. “Maybe a neighbour’s discount,” the clerk joked back. It is not clear whether Obama would have taken the discount, if offered. The first family shopped at the same bookstore last year. On Saturday, Obama was met by a mostly cheery crowd of shoppers and got a round of applause when a baby earned a presidential selfie. Started in 2010 by credit card company American Express, Small Business Saturday comes on the Saturday after Thanksgiving Day, to encourage people to spend their holiday shopping dollars at small businesses. It is the Black Friday for mum-and-pop shops that has become an annual tradition and has gained momentum, spawning “shop local” movements in communities across the country. Last year, shoppers spent about $US5.7 billion at small companies on Small Business Saturday, according to a joint survey by National Federation of Independent Business and American Express. Last year, the president and his daughters bought The Kite Runner, Harold and the Purple Crayon and The Sports Gene.